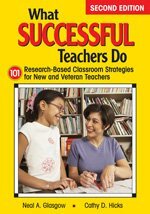 school/community relationships, What Successful Teachers Do, Second Edition is a resource all teachers will reference throughout their careers. Cathy has taught at both the middle and high school level for over 27 years. During that time she was involved in the California State Mentor Teacher Program and has been mentoring new teachers in her district for more than 19 years. Her energy, enthusiasm, and passion for teaching and supporting new teachers reinforce the career path she chose in elementary school. She believes the most effective teachers are the ones who never settle for good enough but continue to grow, stretch, reflect, create, collaborate, and take risks throughout their teaching careers. Cathy is married and has two grown children and one adorable granddaughter.